Self-Defense Training for the REAL World! Gendai Goshin Jitsu You will not find another school like ours anywhere in this area. 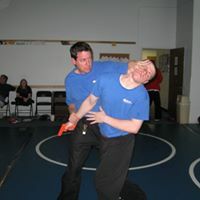 We provide 100% real-world self-defense training, focused on the ability to defend yourself under realistic conditions – not scripted classroom scenarios! Day and evening sessions available. Weapons defensive and offensive tactics. Private Lessons Variety of instructors based on students skill-level and type of training desired. Basic Self-Defense Workshop Approximately 3+ hours of realistic, effective training. Lunch & Learn & Corporate Workshops Speacialized to meet the needs of the students. Contact us at 919-488-0343. Please see Calendar for program schedules. For more information check us out of Facebook or at our website!